The Laker Inn celebrated National Peanut Butter Lovers Month in style, with a special peanut butter menu with items such as a Nutty Bacon Apple Wrap and Peanut Butter Hummus with Pretzels. Known for turkey, mashed potatoes and cranberry sauce, November is always a great month when it comes to food. To make it even better, November is also National Peanut Butter Lovers Month — and Mercyhurst has been celebrating it in style. 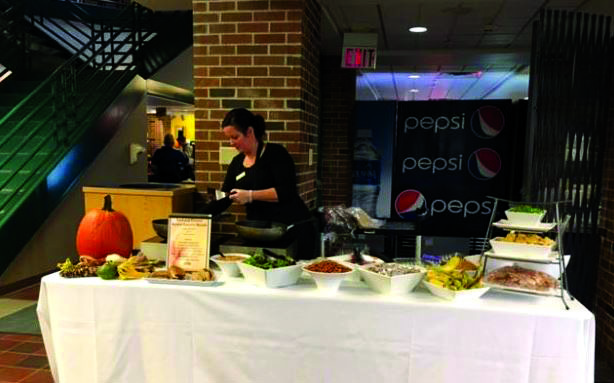 The Laker Inn created a National Peanut Butter Lovers menu and recently set up a large table with numerous options of delicious snacks and plates of gourmet peanut butter made meals. The items that were featured on the menu included a Grilled Peanut Butter and Jelly, a Nutty Bacon Apple Wrap, Noodle Salad with Peanut Butter Citrus Sauce or Sesame with Peanut Butter Noodles, Peanut Butter Hummus with Pretzels and Peanut Butter Chex Mix. The line looped around the entire lower level of the Student Union, with the fan favorite seeming to be the Peanut Butter Chex Mix. Chianne Kline, a sophomore Sports Medicine major, attended the nutty event. “The entire menu honestly looked good just because it all had peanut butter, and who doesn’t love that? The Chex Mix is what caught my eye,” Kline said. The event was undoubtedly a hit. Lori Blakeslee, director of Retail Operations at the Laker Inn, was one of the many individuals that helped put this event on. The staff thought that this event was a good idea because, in the past, peanut butter focused events have always been a hit —including the times that peanut butter milk shakes and trail mix snacks were sold. “We also encourage ideas and suggestions on these fun food events from everyone,” Blakeslee said. One predicament stemming from this event was the concerns of various students and faculty on the issue of peanut allergies — a common allergy. There are many people across campus who suffer from a peanut allergy, which can become very serious. Blakelee put the concerns to rest. “The Grotto Commons offers the Clean Plate Station to address all allergen and dietary needs. The Laker Inn is allergy and dietary sensitive and will handle all needs on a one-on-one basis with students,” Blakeslee said. This event was a huge hit, as have been other similar events in the past. Because of this, the Laker Inn plans on having more delicious food filled days to come. Another event will take place on Dec. 4, called Decorate Your Own Cookie Day. “Next semester you can look forward to Chocolate-Covered Strawberries Day, Ravioli Day, Pretzel Day and more,” Blakeslee said.